DAUMONT - L'Interieur de la Nouvelle Eglise de St.Genevieve de Paris. Title : L'Interieur de la Nouvelle Eglise de St.Genevieve de Paris.. Size : 9.6 x 14.4 inches. / 24.5 x 36.5 cm. 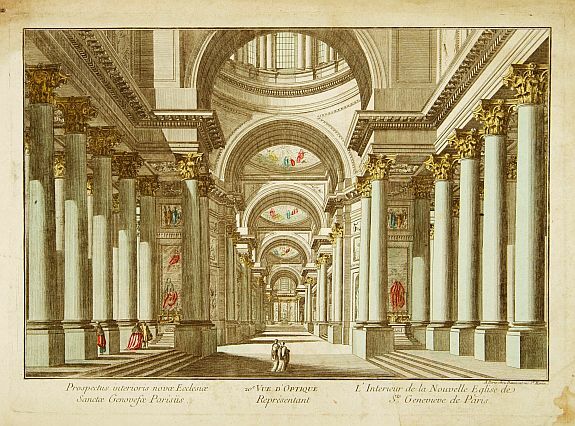 Description :So-called optical print of St.Genevieve church of Paris. Daumont was a well-known publisher of optical prints, established in Paris. 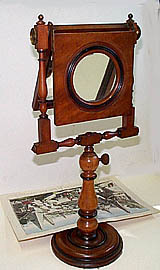 In the eighteenth and nineteenth centuries there were many popular speciality establishments in Paris, Augsburg and London which produced optical viewing devices and special engravings to be viewed through them. In the 18th century the optical print or vue optique came into existence, whose exaggerated converging lines were intended to produce the optical illusion of deep recession. Condition : Paper slightly age-toned as usual.